A recently converted Victorian flat situated on the second floor. Modern Stylish design including an en-suite master bedroom and free wifi. 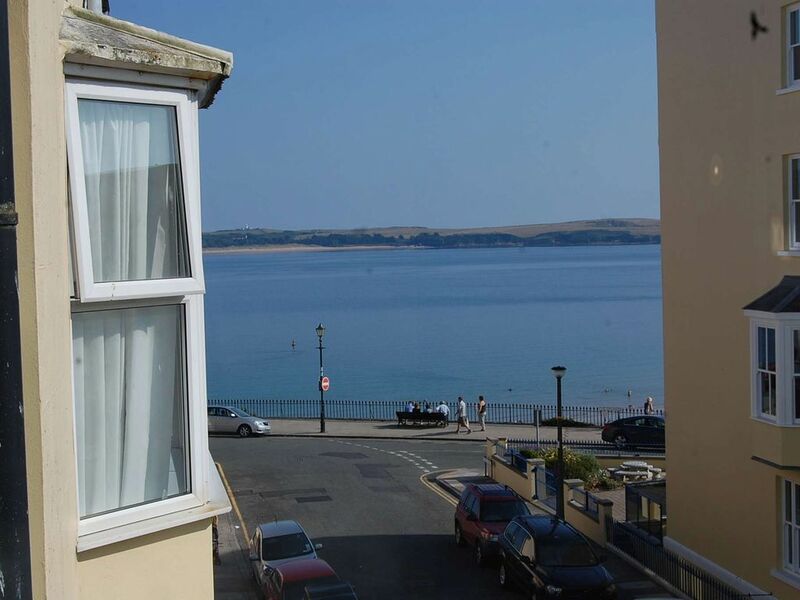 Situated in a quiet location above South Beach Tenby. with stunning views out to sea. An easy stroll to the Beach, enjoy a walk, a swim or a meal at the beach side Bar and Grill or the restaurants situated in the hotels on the esplanade. As a recent guest quoted. Good parking all year round, and easy access to the railway station. I look forward to my mini breaks in Tenby, but in the main season I want people to enjoy my lovely new flat. I love swimming off South Beach, I can take a gentle walk to the beach in my bath robe and be out of the sea and into my hot shower within 3 mins,, that's if I haven't called in for a quick coffee at the beach bar.! This is a perfect location in Tenby. You can park all the year round nearby at the car park end of the street. A quiet street. Every where is within easy walking distance but you are not in the noisy hub bub. South beach is 3 mins away, a beautiful beach with sand dunes stretching to Penally. You can get away from people here and take a wilderness walk. Yet you have a great beach side bar and grill and you are a 5 mins walk to the main street, harbour and Castle and North beach. The flat is in a beautiful Victorian Building, lovely sweeping staircase. It is recently converted, so has the lovely high ceilings, but wooden flooring and airy spaciousness. It is south facing so full of light. I bought it because I wanted a sea view, and I can sit at my breakfast table looking out to see. Tenby is vibrant and full of charactor whether in full season or quiet off season times. the colourful buildings and Victorian charm are the backdrop to the sparkling water. It has 3 beaches, water sports, trips to Caldey Island. Good food in various cafes, deli's and beach bars. Galleries and museums. Good walking and sightseeing in surrounding areas. Golf Links course 5 mins away. All beds are prepared for you. Limited parking on Victoria Street and the surrounding area, Weekly Pay and Display Car Park at the end of the street to the left. TALK TALK Broadband. All connection details in the apartment upon arrival. That flat was lovely very clean and tidy. The stairs did get the better of me but I had asked before hand so was prepared. I would say if anyone with mobility problems were thinking of booking maybe think again as there are a lot of stairs. Only two points, the tv is way too small even with glasses on I struggled and there is no full length mirror would have been nice to have one in the bedroom. Apart from that it was lovely everything you would need for a lovely holiday. Beautiful flat & great location. Much better than the photos. Had a great stay at this beautiful flat. It has everything you could need in a great location. Would definitely return and I highly reccomend. Thank you very much for choosing to stay in our flat and hope you had a successful weekend! I would also like to thank you for your very positive feedback. Apart that we enjoyed the best weather tenby had seen for years it helped that the apartment we stayed in was very nice. When we arrrived it was very clean and tidy. The only two downfalls was that there was a lot of resident parking and if you were unfortunate not to get a parking space you would have to pay £25 per week to park. The other was that the tv could have been a bit bigger in size. Another advantage was that the flat had a washing machine o all the washing could be done if needed. All in all a very pleasurable holiday and I will be booking again for next yeAr, also recommended this to friends and family.